Barbara Meikle is an artist who paints the simple world outside of her door in Tesuque, a village on the outskirts of Santa Fe, New Mexico. Barbara Meikle's art may project peace and harmony exemplified as a colorful burro, or explode in the riot of energy of galloping horses. Enveloping skies of yellow, pink and white may hover over a majestic dark blue mountain that smolders with mystery, or stalks of prayerful flowers may reach for distant stars in an attitude of happy reverence. The views out her door may be of New Mexico, but her work speaks of a larger vision. 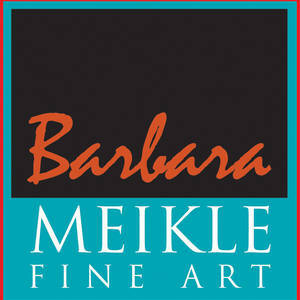 Barbara Meikle is owner and operator of Barbara Meikle Fine Art.